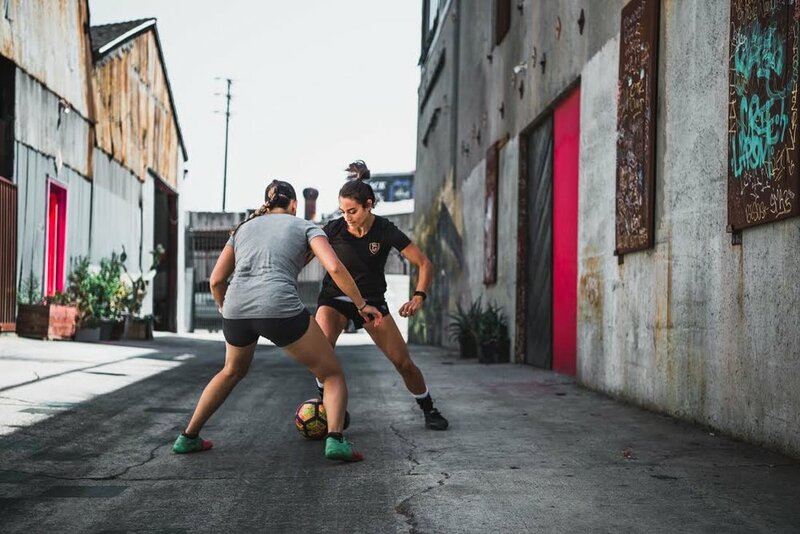 At first glance, Goal Five is an athletic gear brand that tailors its products towards female soccer players, however, there is much more to the company than clothing. Founded by Keely Wachs, Carrie Kessler, and Ann Kletz in 2015, Goal Five is a soccer brand with a passion and a purpose. They are a mission-driven company that is determined to tackle the tough issues both in the sports world and in society. The matter that was placed on their hearts and has fuelled their efforts is that of gender inequality in the world of soccer. There is a gross inequality when it comes to the game of soccer, not only in who gets to play it but also in the gear available to those who do play. This was evident to co-founder Keely Wachs when he saw that the girls that he was coaching would “MacGyver” their gear so that it would fit them properly. Girls would roll their waistbands so their shorts would fit them better, or tie up the back of their too long and baggy shirts because most of the soccer gear available to them was made for boys. Goal Five provides gear that is specifically tailored for female soccer players because when an athletes gear fits them properly they perform better. We believe all girls, regardless of race and socio-economic status, should have the opportunity to play the beautiful game, because when girls play and compete, they become strong, confident leaders on and off the pitch. Co-founder Ann Kletz grew up playing and loving soccer, however, being the only girl in her league she quickly came to realise that there was an incredible imbalance in the sport. And it was this inequality in her childhood that caused her as an adult to begin to look at ways that she could help improve the game that she loved. Playing team sports equips women and girls with valuable life lessons, where leadership skills are developed, and teamwork is not just encouraged but is necessary. Playing the game teaches girls how to be confident, to love and support the team around them, and to work harder rather than giving up. This is what Ann learned playing soccer, and they are the skills and attitudes that she and Goal Five want every young girl and woman to gain and experience when they play the beautiful game. Through their three-pillar approach Goal Five is addressing the issue of gender inequality both on the soccer pitch and off. They offer products that are tailored and sewn to fit the female athlete so that she can perform to the best of her ability. By donating five percent of their profits they are helping to ensure that girls all around the world have the opportunity to play “the people’s game.” And finally, they’ve developed a platform that allows for them to address issues of inequality both within soccer and in society. However, resolving the issue of gender inequality isn’t a problem that is solved solely by women. Goal Five believes that it will take every mom, dad, grandparent, girl and boy, soccer club, development institutions such as The United Nations, governing bodies like the US Soccer Federation and FIFA, as well as professional athletes to strengthen the movement and push gender equality within the soccer world forward. Through the hard work and determination of Goal Five, girls all around the world are not only gaining access to gear that is made with them and their success in mind, they are also gaining greater access to the game now more than ever before. But first and foremost they are helping to shift the social dynamics towards that of equality and inclusion. You can get 15% off your next order at Goal Five by using code 'G5equality' at checkout. Follow their logo below to shop their collection.